A long-vacant lot with a run-down building at the corner of U.S. 158 and The Woods Road will be the site of a new gas station and convenience store under a conditional use approved by the Kitty Hawk Town Council. The filling station is the first phase of a development that could eventually include multi-family housing. A notable condition put on the project by the Council last week is adding a concrete median to prevent left turns into the gas station from westbound U.S. 158. It would be similar to the one recently added on U.S. 158 at Kitty Hawk Road to block left turns into the 7-Eleven. 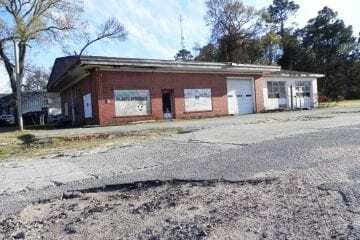 The 6.25-acre lot includes an abandoned, 3,100-square-foot service station building that was built in 1958, according to Dare County tax records. The land and lot are valued for tax purposes at $429,800. Eddie Goodrich, who brought the concept to the town, said construction would begin in June or July. The gas station and convenience store will total 28,000 square feet and include 20 parking spaces. No underground gas tanks remain on the lot, Goodrich said. In September, plans for the property went before the Town Council, which approved a zoning text amendment to allow multi-family developments in Planned Commercial Developments in BC-2 zoning districts. Planning Director Rob Testerman told council members the new wording would affect three parcels. But Mayor Gary Perry noted that the town was most interested in the unsightly lot at one of the first intersections visitors see after crossing the Wright Memorial Bridge. The land has been vacant for some time and has drawn criticism as an eyesore from town residents, and as Perry noted, “also from our neighbors to the north,” a reference to officials in Southern Shores. BC-2 districts in Kitty Hawk front U.S. 158 or N.C. 12 and were originally reserved for beach commercial activities, including PCDs, such as strip shopping centers. When the Barrier Island project near Walmart was being considered, the town agreed to allow multi-family units in a PCD if the parcel was at least 10 acres. The new amendment extends multi-family development to PCDs in BC-2 districts and decreases the minimum parcel size to 5 acres. Such lots must have at least 500 feet of road frontage along U.S. 158 or N.C. 12. Besides the lot with the vacant building at 6100 N. Croatan Highway, the other two parcels are the U.S. Post Office and the Kitty Hawk RV Park, both of which abut U.S. 158. In January, the Town Council reduced the distance gas pumps can be from a highway from 70 feet to 50 feet, the same as allowed by the state. Only right turns will be permitted in and out of the filling station and convenience store on U.S. 158. Access in both directions will be available on The Woods Road. The mayor should move to KDH where gas stations and fast foods joints are loved. This is his vision of Kitty Hawk ? Still no mention of the brand of station. Hope they’re smart enough to have non-ethanol gas available. Hope the new Gas station & store is LEED Platinum & part of the storm Fortified program & has E-85. Hope it’s a WAWA! Lit up like a space ship all night long. Decent subs. 10 pumps! Hope they build a Dunkin’ Donuts and KFC/Taco Bell next to the huge WAWA and multi family apartments ! 0ldN3ws, can you say that in English, please? And I second the Wawa! Great, another place on the beach to buy overpriced gasoline. OldN3ws. LEED Platinum or any LEED certification is a joke. Read up on it and see the things that give you points to each level. It’s just more It’s “GREEN” so it has to be good no matter what stupidity. IE, GREEN does not always mean less pollution; waste; energy use; CO2 emissions or etc. further more, E85 only drives up the cost of anything that has corn it as well as feed used for animals. E85 just like any gas with Ethenol in it gives you much WORSE gas mileage; DESTROYS boats, small motors and plane engines. It also cannot be used in MANY new vehicles. I’m sure you are thinking “No Offshore drilling” but remember almost everything in your life has petroleum products in it; especially your Tesla or Prius.